As the opening ceremony in December approaches, both Oodi builders and the library staff are becoming increasingly busy. The entire staff of Oodi has been assigned to the library from the beginning of October onwards. “We are now clarifying the job descriptions and carrying out training, which is focused on digital competence and self-directed teams. Currently, we are tendering the cleaning and security services. 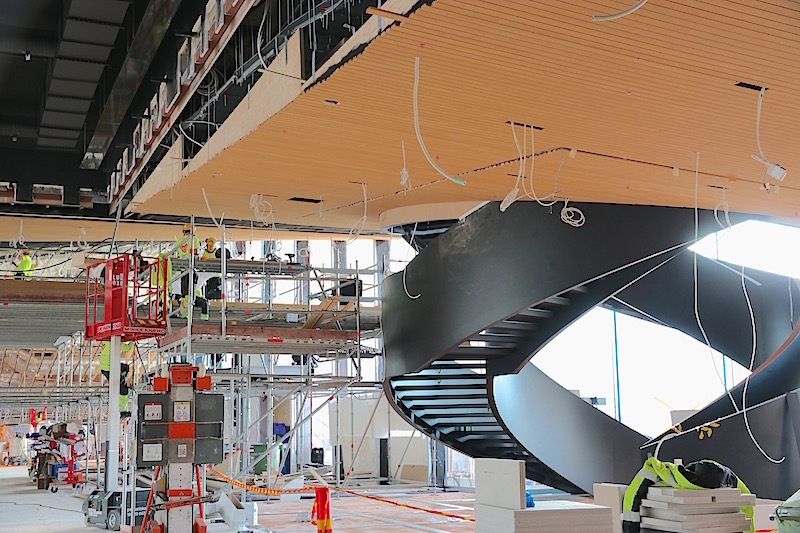 Planning the spring and summer events of the new library is already well underway,” says Anna-Maria Soininvaara, Director of Oodi. Service Manager Sami Jyläs (left in the photo) is one of the assigned staff members. During the worksite tour in September, he was particularly impressed by the book heaven on the third floor, which had a wow factor. The schedule is tight and the workers on the site work in two shifts, up until midnight. 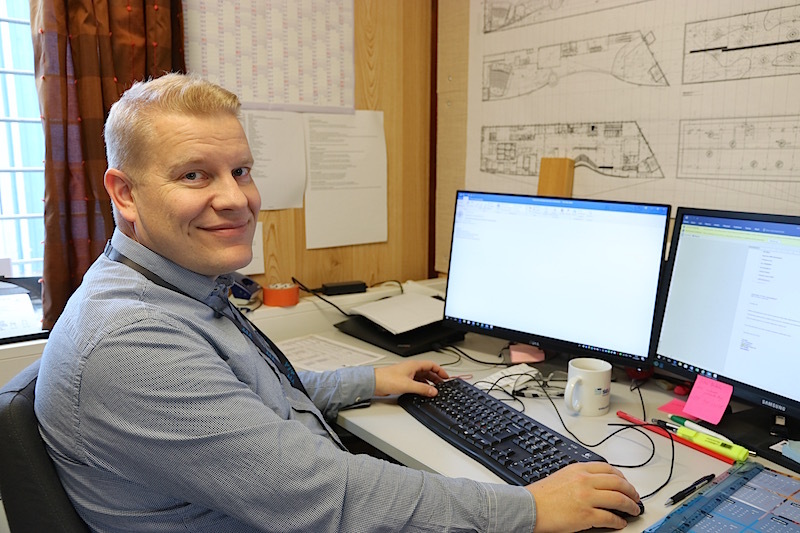 For example, the builders of suspended ceilings and installation floors as well as the parquet fitters have worked in two shifts, according to YIT’s senior site manager Tero Seppänen. “When the suspended ceilings have been finished, they will be equipped with safety lights and smoke alarms. 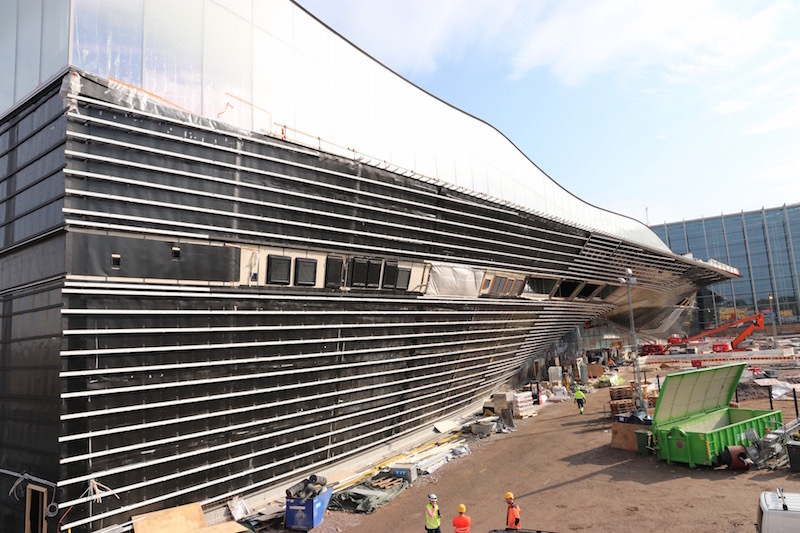 The measurements and adjustments of the ventilation system are still under way. The largest separate work phase, i.e. cladding of the facade, is still ahead. It will start in October from the north end, continue to the eastern side of the building and then towards the south end. The western facade will be the last to be completed. It is the most challenging part, due to its shape,” says Tero Seppänen. In total, 50 kilometres of the final cladding material, battening made of spruce, will be needed to cover Oodi’s facade. 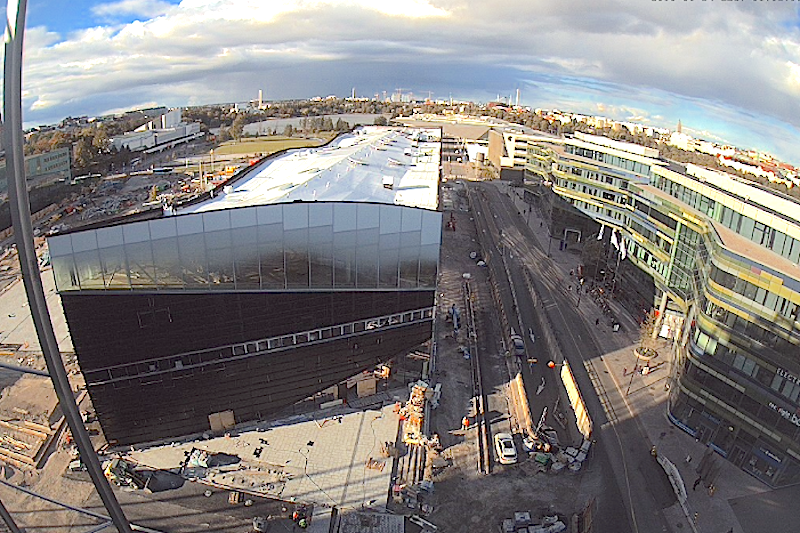 Even though the western facade will be the last to be completed, the cladding, in white, is mostly finished. The cladding materials will be delivered from the Timbeco factory in Estonia. 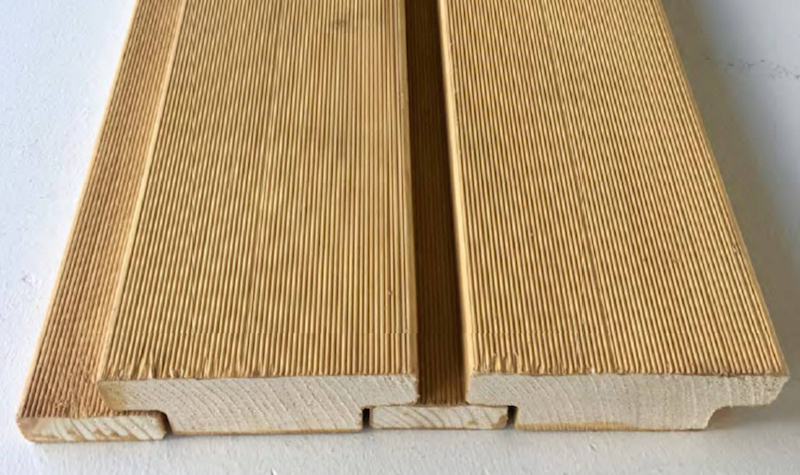 The idea of the facade’s cladding are laths cut to a T-shape and their installation method, which leaves a shadow gap between the lathes of the facade, as shown in the image. On the backside, the screws will be concealed so that their bases will not be visible. Timbeco delivers the facade cladding on the worksite as 1.2-metre-wide elements. In a week, 30 metres of cladding is installed. 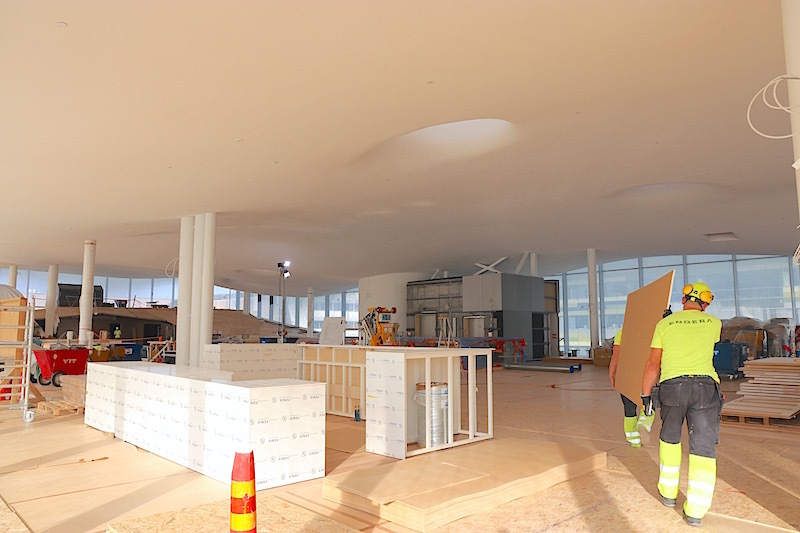 In September, Oodi’s roof received its final surface, a white sheet, that further helps waterproof the building. Seen from above, the roof and the third floor’s “snow fall windows” give an impression of a building that is covered by a layer of snow. 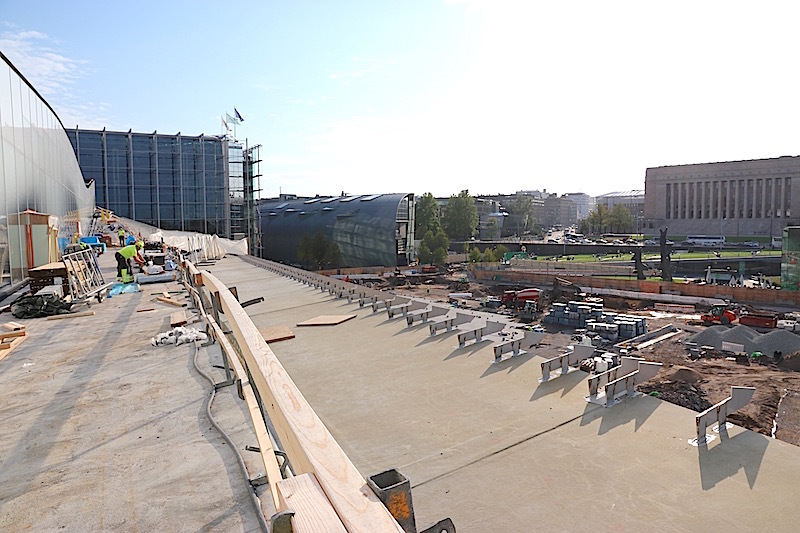 The street paving in the south end of the building is almost complete, and the foundations for flagpoles and bicycle stands were cast in the area in September. Even though the sounds of construction still carry throughout the building, there are fixtures and machines everywhere that hint at its opening. 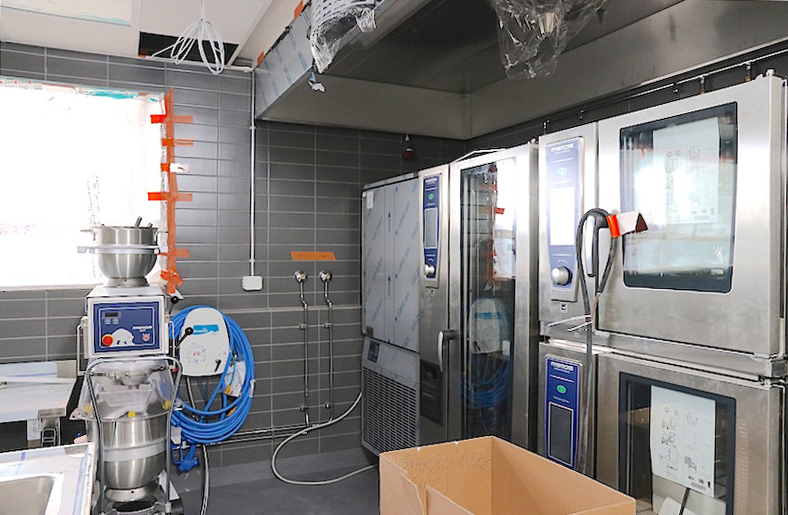 For example, the permanent fixtures of kitchens are in place, and the kitchen serving the first floor restaurant has received its equipment. The dishes and warm snacks of Oodi’s restaurant will be prepared here. Stoves, soup kettles and ovens are just waiting to be connected. The second floor houses a smaller, more comfortable kitchen near the meeting facilities. 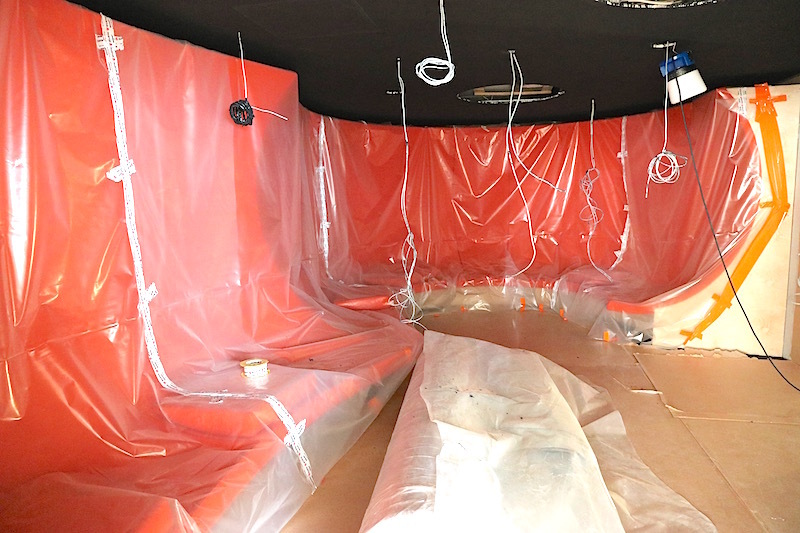 Inside the building, the work is now busiest in the entrance floor, where workers are installing the suspended ceiling and the tracks of the movable walls of the multi-purpose hall, for example. The hall is located on the eastern wall, opposite the spiral staircase. The second floor is dedicated to work and hobby activities. 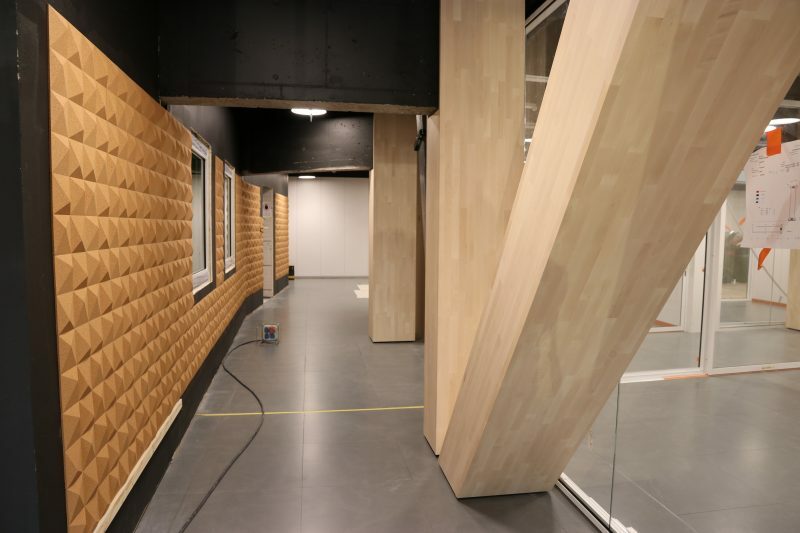 The studios and audio-visual premises in the north end have been equipped with cork wall boards that help insulate sound. The steel pillars that characterise the floor have been covered with birch veneer. The so-called quiet room near the south end features a green wall that brings added comfort. Shelving the books before the opening ceremony is one of the major challenges of Oodi’s staff. The shelves will be delivered to the “book heaven” on the third floor in October. They will come from Italy, as will their fitters. The north end of the floor is dedicated to children, and there is also a space for children under the loft. One of the first fixtures to arrive was a bright orange, curving high-backed sofa that will be placed in the story room under the loft. This room is intended for some quiet relaxation. The activity space is located next to it. In book heaven, customers can also enjoy coffee and small snacks. The café seats about 40 people, but during the summer, the Citizen’s Balcony offers more space for refreshing breaks. The frame of the sales counter was installed in September. Oodi is one of the landmark buildings in Helsinki’s inner city, and its balcony also offers a perfect view of the unique environment. Kansalaistori Square, Sanoma House, Kiasma and the Parliament House are all part of Oodi’s high-profile neighbourhood. 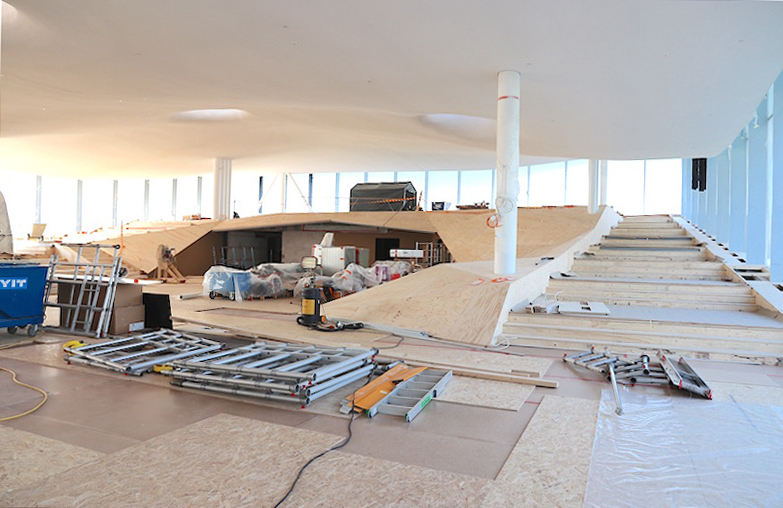 The installation of the floor of the Citizen’s Balcony is about to start. The chosen material is Accoya made of pine, which is highly weather resistant and has good dimensional stability. The railing will be made of steel wire rope, resembling a web. The balcony also offers a view of the Helsinki Music Centre, the National Museum of Finland, Finlandia Hall and Töölö Bay. 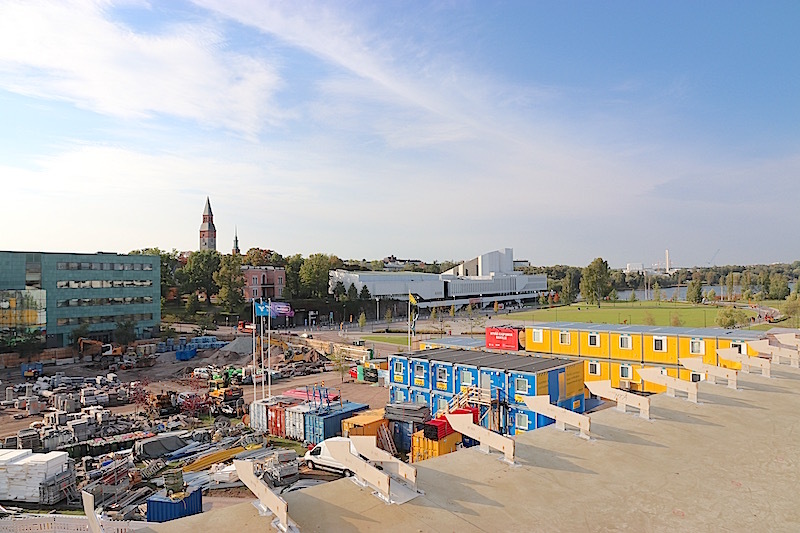 In a few months, the yellow barracks of YIT will disappear, but Destia’s blue worksite base will remain for a while longer. Destia will be building Kansalaistori Square, Loru playground and Makasiinipuisto Park until July next year, when the Citizen’s Balcony will finally have a view also of the nearby park. All Digital Week at Oodi 26.3. © Copyright 2019 • Oodi • All rights reserved. • Website crafted by Evermade.